Video: Horse that falls down to avoid being ridden. “Stacy Westfall , Have you seen this video? What would you do to fix this?”-Ashley N.
No, I hadn’t seen this video until you posted it here. It was an interesting watch and I think I will answer your question in two parts. First, if the horse is laying down to avoid being ridden he has learned that there is a reward for lying down. 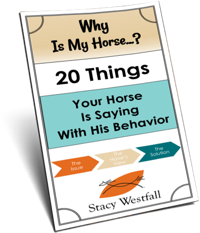 The simplest answer is to either prevent the behavior that leads up to the horse going down or to make it uncomfortable for the horse to stay down. Tapping persistently until the horse chooses to stand up would be enough to make him think about getting up. My issue with the video is that it looks like this horse was trained to lay down on purpose. I have seen horses trained ‘accidentally’ to lie down. One example of this was when I was in college and I saw a horse get dizzy while learning to spin like a reiner. All was fine during the spin but when the rider said ‘whoa’ and the horse stopped he started wobbling, lost his balance and chose to lie down. It was slow motion and no one got hurt…in fact the girl got off and laughed. Everyone laughed. The horse got a nice break and eventually stood up. Apparently the break was long enough because the next time the girl asked him to spin he started to…but then chose to lie down. Again she laughed and didn’t make him get up. Within a couple of days he would lay down every time she asked him to spin…then she stopped laughing. The key difference with that horse and the one in the video is that the one in this video doesn’t lie down smoothly like a horse in a pasture would. Horses choosing to lay down usually look like…well, horses choosing to lay down. This one is unnaturally stiff. He does get smoother on the second time but he also backs into it which is also unusual unless trained. This one looks like it was trained to bow on two knees and then had its head pulled to the side. Notice how stiff the horse is when it collapse to the ground. When is the last time you saw a horse lay down like that on its own? If this horse had thought of this on his own, the odds are he would be smoother. Even if it is trained he will get smoother with practice. I have trained several horses to lay down. The first few I taught to bow and then lie down and they all had this stiff look shown in the video. I didn’t like the look and the horses had trouble connecting what I wanted so I changed my methods. Now my horses draw their legs together and choose to lay down very smooth the way they do naturally. Once down most horses do tend to lay very still, almost stiff, when on their sides. I have never tried sticking a carrot in their mouth to see what they would do…but I think I will be buying a carrot and giving it a try with Newt, lol. Who knows, maybe I am wrong. Maybe this horse did just start doing this stiff fall on his own. Stranger things have happened. Horses are certainly smart enough to connect the dots if they find an easy way out of work. ← Why does my horse paw while eating grain? I was told of a driving pony or horse that would lie down instead of work. When taken to a trainer, he solved the problem by spraying water in it’s face. P.S when you understand the triggers for this response you can desensitize and fix the problem. Had a horse that would throw itself down when saddled…..King Ranch mare….turned out to be genetic her colt did the same thing…only he would lock up when mounted then touch his nose to the tip of each boot (like making sure you were astride 🙂 and if you asked him to go the rodeo was on with him eventually throwing himself down, I had no cash to buy another horse so I learned to “un-lock” him by getting off and lunging him both ways until he moved off without hesitation. He always did this the first time on the rest of the day he’d be fine.Other than that this horse was awesome would sidepass ,spin, anything i asked he’d do. Tough as nails couldn’t wear him out. I had a mare that would do this after we would work for a while or she was frustrated trying to do something. We thought it was a vice but later found out she had a brain tumor! Also I had a gelding who would fall over while driving he had seizures when we had him checked out so I would try to find out if this is a medical reason not a vice. Wow, that is the second brain tumor causing this…how interesting! Would also explain the stiffness. I think it’s obviously a parlor trick, but very funny indeed. Pretty awesomely trained horse, yet still the horse has a mischievous expression as though he is really playing along. Too funny. I use to work at a trail guide and I was so attached and accustomed to this specific horse that when I rode another horse and put another person on him, he very carefully layed down in the middle of the trail and refused to move until I got on him. It was hysterical and someone filmed it I think. I guess laying down is a little safer than a Bronc ride??? Had an old stock mare loose on 50 acre rolling pasture and she’d turn away when we came out with the halters and lie down in a ‘dip’…not even always the same ‘dip’…very hard to find. She’d heave up to her feet as soon as we got the halter on though. Dear ‘Mary’! I knew a mare who trialled for racing, but after every run she would return to her stable and fall down like this and ‘play dead’ for ages… she never progressed to racing – her heart wasn’t in it. She’s a great trail horse now, with never a misstep or a lie down! We had a week of pony club camp one year, Had to drive up the hill with the trailer to get the horse . By Wednesday the horse would lay down when she saw the trailer coming up the hill. I would go out to the pasture to get the horse and she would even try snoring . She did it three days in a row, would take about 20 or more minutes to get her up. She learned that it really didn’t work that well but she really gave it her best shot. I know a horse who when he lays he just kinda falls. He gets about half way down then just falls and then when he gos te get up he kinda props himself up on his hind end then gets up and is very stiff after but he never does this. Thought it was interesting to watch thanks for sharing it. I have a 3 year old that I just started driving reins on and he laid down 3 times on me the first time.. no rhyme or reason… very frustrating…. 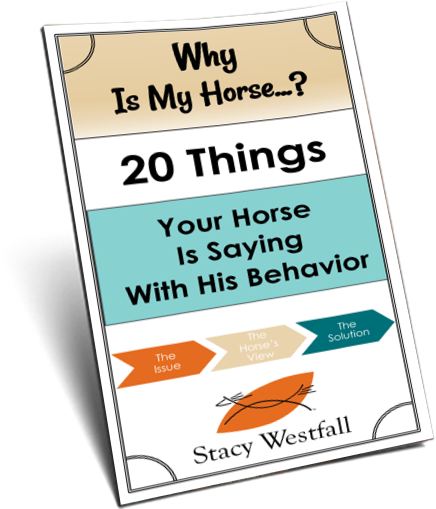 I sure am not teaching him lol but I get on his rear end fast when he starts to try to stop before he gets down.. no clue why he does that….